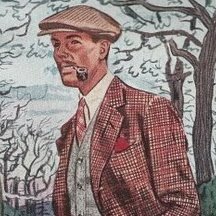 The Trad: Heavy Tweed In Spring? Thanks for the heads up! HTJ just seems to disappear so often I rarely think to look for it. It doesn't have the Tintin verve though. As for literal tweed in spring, you certainly can in Toronto this week. It's been full-on lined Barbour weather for the past five days. OG - Toronto has been plain disgusting these past few days. I live mid-town (though originally from Boston). Where are you based? As for oysters, Rodney's is good. Trad - you would like the fact that they do dark and stormies there. love that hes back in action. I've been wearing a Cheviot tweed coat during the past week in CT so it's not that crazy.